Viola Davis Brings A New 'Corduroy' Book To Bear Inspired by her daughter, the Emmy, Tony and Oscar-winning actress has written a picture book. Corduroy Takes a Bow continues the adventures of a curious teddy bear and his young (black) friend Lisa. 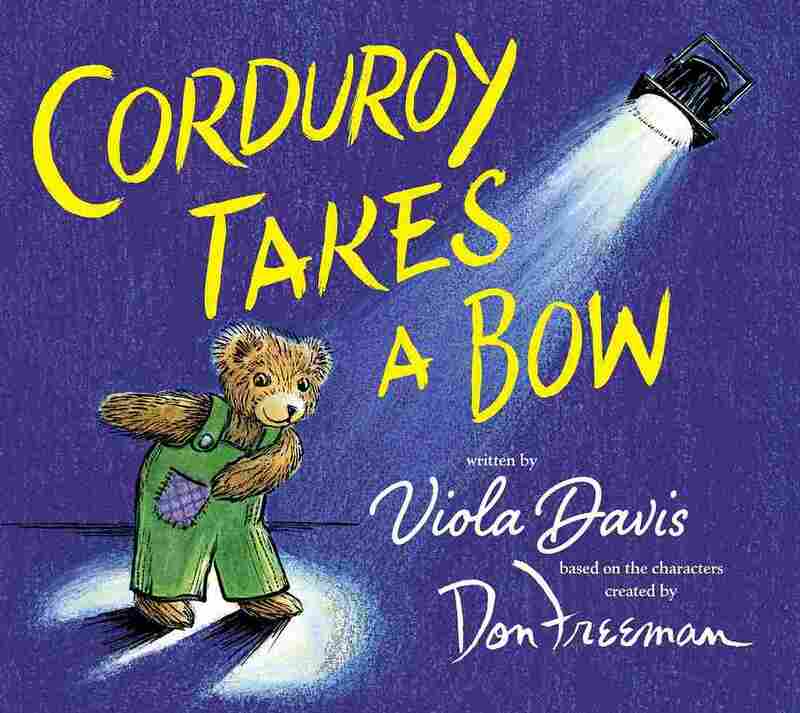 Viola Davis has written a new children's book — a sequel to Corduroy, which stars a teddy bear and his young friend Lisa. Viola Davis is known for her roles in movies like Fences and The Help. She's won an Oscar, an Emmy, a couple of Tony Awards — the list goes on and on. But as we sit in her trailer on the set of the TV show in which she stars, How to Get Away with Murder, she tells me about a time before all of this — when she grew up in a condemned building in Rhode Island, sleeping on the top bunk with her sister to be safe from rats on the floor. She had a way to get away from all that. "Reading was the escape," Davis says. "Reading was an escape into an imaginary world where none of those things existed — where I could re-create myself and I could re-create a life where I played a better role. And it's that place, in reading, it was that place that sort of saved me — going to the library every day after school when I was [in] kindergarten, so 5 years old ... by myself." That early love of reading inspired a different kind of project for Davis. She has written a sequel to the children's book Corduroy. Fifty years ago, author and illustrator Don Freeman brought us the story of a stuffed bear searching for the button that was missing from his green overalls. Corduroy had something that many children's books lacked: diversity. Corduroy's friend Lisa is black. Viola Davis loved reading Corduroy to her daughter Genesis, now 8 years old. Her take sees Lisa and the teddy bear visiting the theater in Corduroy Takes a Bow. I guess because with my daughter, I make up stories with her too at night. And soon as I start a story, I'll say, "Genesis, once upon a time." She said, "Put me in a story mommy! I want to be in a story!" And I think that's why Corduroy and writing this book has played such a large role, because I want her to be included in the story. I don't want her to have an experience like mine, which was: I had to escape to be feeling like I was in the story. I want her to actually feel a sense of worthiness. That's what it is, a sense of worthiness. That's why I love Corduroy. The fact that Lisa's African-American and her mom — it's her way of knowing that she's a part of something. Well, the message, first of all, is: Lisa has created a world that is a reflection of her. I think that's the beauty of it, too. I never knew that that was even a choice when I was growing up. I always had white dolls, you know, which is — nothing wrong with that; I love my dolls. But the fact that she has a doll that is a reflection of her — I just love when the imagination becomes reality. I love the journey and the attempt to take what is burgeoning in you, that gives you so much joy in creating a life, you know, even if it's in your room, that's alive. That's what it meant to me. I love it. I mean, oftentimes in my life, even sometimes when I do movies or even a TV show, it's like you've got to justify my presence. I sort of have to represent a social statement or an idea in order for people to say, "Oh, that's why she's in it." No one really actually thinks about just sitting with me — that I'm just a person. And that's what I loved about the book even when I first read it — that Lisa is just the character in the book. She just happens to be the character. And that's what I want my daughter to feel, too. I want her humanity to be acknowledged. I tell her that all the time, even about her feelings. If you want to cry, you cry. Mommy understands. Sometimes Mommy wants to cry — sometimes Mommy wants a ba-ba, you know? [laughing] You know, and you should love your hair, you should love your beauty, and then sometimes you're going to have challenges in that, you know. And I think that that's what books do also. They give you permission to, sort of, be. Taylor Haney and Ashley Westerman produced and edited this story for broadcast. Patrick Jarenwattananon adapted it for the Web.